This Presentation date is July 25, 2017 at 14:00 - 16:00 local time. 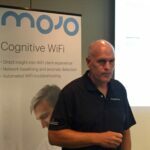 Rick Wilmer, CEO, introduces Mojo Networks, introducing the delegates to the company mission of breaking the old controller based wireless networking business model, and offering wireless infrastructure as a service. This mission is built around open hardware standards, and using software-defined functionality to speed innovation. Kaustubh Phanse, VP in the Office of the CTO, introduces Mojo Aware and discusses how it can help Wi-Fi professionals troubleshoot wireless issues much more quickly with more visibility. In addition, Mojo Aware helps remediate user issues to increase wireless network satisfaction. 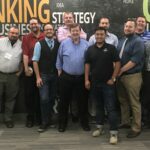 Brian White, VP of Product Management, discusses how Mojo Networks believes their solutions can scale past the SMB/SME environment and into a full-scale large enterprise campus. Their cloud architecture is designed specifically for the large campus, including with tunneled VLANs. This includes a centralized management plane, a distributed control plane, and a data plane flexible enough to handle the large scale routing needs of a campus deployment. Heman Chaskar, CISO, discusses the difficulty of security in the cloud management space, especially in IaaS and SaaS environments. Mojo Networks moves away from having to audit the security of each individual cloud service provider, while still being able to have assurance when using a 3rd party. Heman reviews how Mojo uses security certifications as a more practical assurance. This informs the rest of their security model in their solution. Pravin Bhagwat, CTO and Co-Founder, discusses the challenges that come with building massively large Wi-Fi networks and how Mojo Networks has the architecture to address many of these concerns before they become problems. Mojo Networks rejects the idea of simply stacking controllers to scale a networks. Pravin goes into a high level overview of the Mojo Networks architectural solution to give elegant scale to customers. Pravin Bhagwat, CTO and Co-Founder, discusses the addition of a third radio transmitter to the Mojo Networks access point and how it can help collect data and aid troubleshooting for Wi-Fi professionals. Also included is a demo using Amazon Echo and Alexa to report on network status.